The film opens with Batman (voiced by Kevin Conroy) finding a playing card. Our minds go immediately to the Joker, but it is not; it is the Royal Flush Gang. 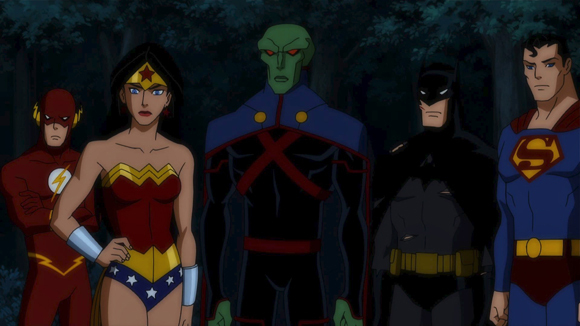 The Justice League – Superman, Wonder Woman, Green Lantern, The Flash, and Martian Manhunter – comes to help. This is the first time we get to see the characters’ designs, and there is something vintage about them. We still see a lot of the classic Bruce Timm style that we’re used to seeing when it comes to DC Animated films. I love the design of all the characters.There’s something amazing about the way Green Lantern/Hal Jordan (voiced by Nathan Fillion) looks. After the Justice League takes down the Royal Flush Gang, we are introduced to Cyborg (Bumper Robinson). know this is a surprise to you. I mean come on, supervillains trying to kill the good guys – that never happens in these films, right? Take a wild guess what the next couple scenes are. That’s right, The League of Doom taking down some of our favorite DC superheroes. I have never been a fan of scenes like this in animated films. I feel like they slow down the story. But I understand why they are there: to introduce new fans to the characters and rivalries, such as Batman vs Bane, etc. 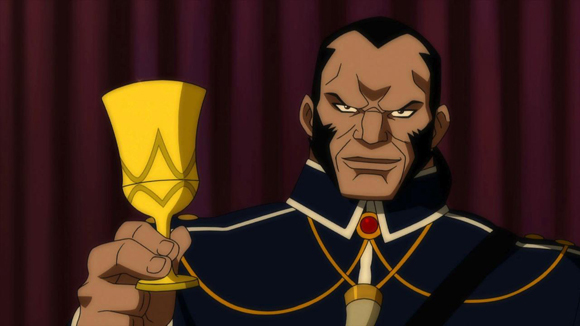 After the villains take down our heroes (which takes 20 minutes of the film – way too long for me), Vandal Savage wants to…. wait for it…. well, let me quote him, because this is kind of funny coming from a guy who dresses like Liberace: “The next stage of my plans might be considered….genocidal.” We get a flashback of Savage over eighty thousand years ago (yes, you read that right). There was a meteor that fell to earth that night, where Savage slept, and the next morning he found out that he can never die. How evil of him. We have never, ever seen this in a comic book villain. Can you tell that I am joking, and that I kind of stopped caring about this film at this point? And there was still over 35 mins left. In Savage’s new world, money doesn’t matter because “it’s trivial in the long run.” After more flashbacks, we find out that Savage thinks that “humanity is prideful and belligerent.” So by destroying half the world, Savage would have to be the new leader to those who survive. So how do you think Savage will destroy half the world? By making them watch old episodes of Super Friends? At the same time, Cyborg and Wonder Woman have a heart-to-heart talk. They find out that the new League of Doom is behind this attack on the heroes. Batman finds out that the other heroes are in trouble, so he joins Cyborg and Wonder Woman to help them out. Batman is kind of a jackass with the rest of the Justice League, in the particular Batman way. 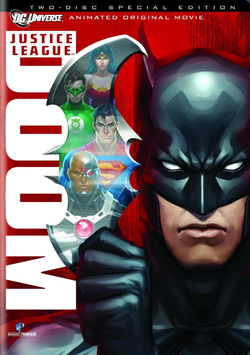 Justice League: Doom on blu-ray, DVD and for download on February 28 this Tuesday. What is amazing is that one year after creator Dwayne McDuffie’s passing, his work lives on. This is a great film if you’re a fan of the DC Animated films. This is not my favorite one, but it is a perfect introduction to new fans or fans that have not been reading comics in sometime. The goal of these films is to get people back into the comic shop. I am sure this will make people excited about picking up comics again.